Those guys at Denman and Batiste are spoiling you! A red diamante studded Denman hair brush? Yes please! 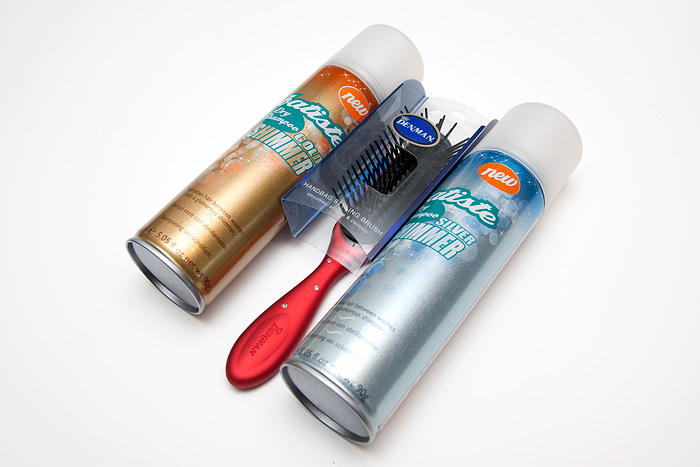 And if that isn’t sparkly enough for you, how about some Batiste shimmer dry shampoo too! Perfect for nights out on the tiles! Leave a comment to enter. Giveaway closes at 23:59GMT on 15th January. Aw, I’m Canadian so no luck. Still here though! Wooow, interesting. Never tried the shimmer stuff before. Please enter me, I’d love to try the shimmer shampoo! Nice price, enter me please! I want one of those brushes!! Thank you! Did I miss day 7?? Anyway, not in the UK, but how generous of these companies! They look amazing, too bad its UK only Not eligible. Enter me please!!! Not seen those batiste in shops!! Not eligible, but good luck UK ladies! Not eligible – but dedicated none the less. Also, the ‘shimmer’ part in that shampoo has me intrigued. To Google! oooh, enter me please! I need some more sparkle in my life! Wish I lived in the UK to win this one! would like to win “Most Dedicated” ! Please enter me! I love Batiste products! They’re really good! Sparkly! You know, I’ve never tried the Batiste shiny shimmer. I bet they just give you shine but in my head I see gold glitter on my hair. This is what happens when you’re a child of the 80s. So I stick to the tamer versions. hummm. may have already entered this one. can’t remember! eligible to win, but dedicated I am! Dry shampoo became my best friend when we had no water for 4 days over Christmas!! enter me please, this is one of my must haves. Enter me! I have platinum hair so I can’t help but wonder whether the gold or silver shimmer would look best! Ooh can’t wait to try out some shimmery dry shampoo, enter me please! I’m not eligible. Good luck to UK girls. Oooh, gorge! I like the brush! I can’t win this, but i could use a pretty brush like that.